Does Your Workplace Offer Fitness and Health Incentives? The benefits for employers result from the welfare of their employees. Healthy employees provide the company with a strategic edge, and by investing money in a program that will bring them lowered expenses in return keeps them ahead of the competition. Employers can expect to see its workers performing more efficiently, with lower absenteeism and lower health care costs. Other indirect benefits for a company providing these programs include job satisfaction, as well as raising retention rates and incentives for hiring. The welfare of employees has a direct impact on the success of the company. Workplace wellness programs can help you get healthier, even if that simply means learning how to reduce stress and muscle strain when you are on the job. Depending on what your company offers, it might also help to lose weight, lower your cholesterol and blood pressure, sleep better, and save money on prescriptions. You may even find your life taking a new direction, such as the desire to become more involved in recreational sports teams or other forms of competition like marathons or bodybuilding competitions. Sometimes, all you need is a little motivation to get the ball rolling and a workplace wellness plan might be it. Another great benefit of wellness programs is a built sense of camaraderie with your co-workers. You’ll have a chance to experience activities with them that aren’t related to work, whether in a walking club or sports team, by having lunch together, or by going to the gym. Social support is a very important part of weight loss and getting fit. By interacting with co-workers, you’ll have others to give you encouragement when you need it, as well as to hold you accountable to your goals. Plus, you’ll be motivated by seeing other’s positive results. By using a wellness program, you’ll be an important part of the team. If you work for a large company, chances are there is already a Health and Fitness Program in place. You can find out if there is one offered from your Human Resource Department. Many smaller companies do offer these programs as well; discuss with other employees and your employer whether it is something that your workplace should offer. If you have any questions about setting up a company health and fitness program or corporate discounts please contact us info@fitnessfocus.ca. Have you tried Yoga at Fitness Focus? We encourage all experienced or beginners to come check out our Yoga classes. No need to book a spot, our studio is large enouge to accommodate classes up to 25 people at a time. Check our Group Fitness Schedule for class times. You know that yoga is good for you, but here are some benefits and information about Yoga you may not know! Flexibility: Stretching your body in new and different ways will help your joints and muscles to become more flexible, giving you better range of motion. Over time, you will gain flexibility in your legs, back, shoulders, and midsection which can all prevent injury and aid in your resistance training. Strength: Many poses in yoga require supporting the weight of your own body in new and different ways, including balancing on one leg or supporting yourself with your arms. The slow movements through the poses also develope strength. You can also expect to see improved muscle tone, better shape and long lean muscles. Pain Prevention: Increasing flexibility and strength will help prevent certain types of body pain. For example, many people who suffer from back pain can usually trace it back to spending much of their time sitting or high impact activity all day. That can cause spinal compression, which you can begin to address with yoga. Yoga will also improve your alignment, both in and out of class, which helps prevent many other types of pain. Better Breathing: Most of us breathe very shallowly into the lungs and don't give much thought to how we breathe. Yoga breathing exercises, called Pranayama, focus the attention on the breath and teach us how to better use our lungs, which benefits the entire body. Certain types of breath can also help clear the nasal passages and even calm the central nervous system, which has both physical and mental benefits. Mental Calmness: Yoga asana practice is intensely physical. Concentrating so intently on what your body is doing has the effect of bringing a calmness to the mind. Yoga also introduces you to meditation techniques, such as watching how you breathe and disengagement from your thoughts, which help calm the mind. : Physical activity is a great method for eliminating stress; this is particularly true in yoga. Yoga provides a much-needed break from the stressors in your life, as well as helping put things into perspective. The emphasis yoga places on being in the moment can also help relieve stress, as you learn not to dwell on past events or anticipate the future. You will leave a yoga class feeling less stressed than when you started. Body Awareness: Doing yoga will give you an increased awareness of your own body. You are often called upon to make small, subtle movements to improve your alignment. Over time, this will increase your level of comfort in your own body. This can lead to improved posture and greater self-confidence. Spring Bootcamp Starts June 7th! Outdoor Bootcamp Will be starting soon! 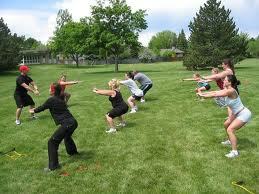 Outdoor Bootcamp will be running twice a week from June 7/11 through July 14/11. Spots are limited! For information on times and price or to secure your spot; please phone 244.6413, email us at info@fitnessfocus.ca, or come down to the club. Metabolic Conditioning (metcon) is a sequence of exercises coordinated to get the maximum benefits of a full body workout.